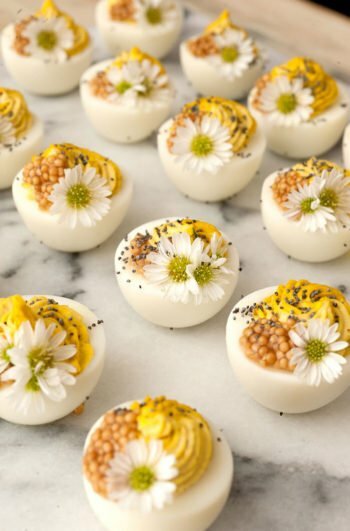 Want to create the prettiest Valentine’s Day deviled eggs? All you need is some mustard, mayo, creamy horseradish and a little drop of dye or all-natural beet juice color. They’re so pretty, they’ll make cupid’s wing flutter! Oh, just look how much love you can fit into a tiny, little appetizer! 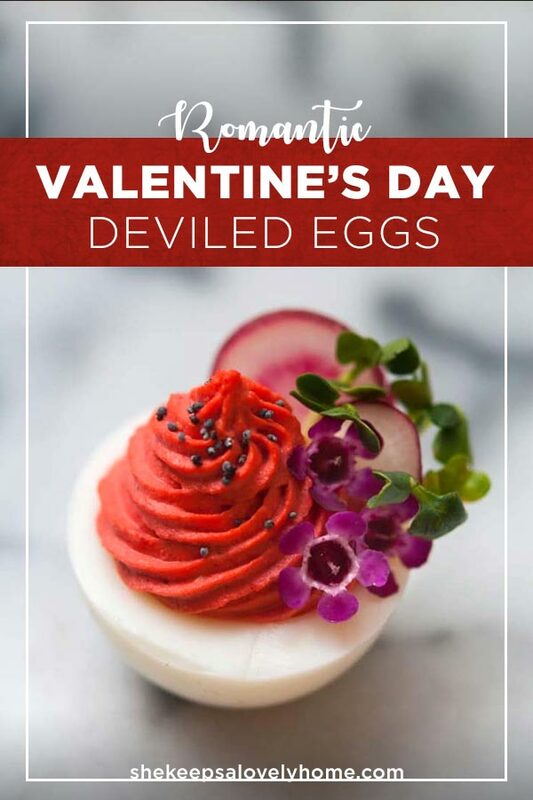 I love Valentine’s Day-themed deviled eggs. They’re so pretty and perfect for a Valentine’s Day party. The flavor is perfectly traditional with some exciting surprises. I added these fantastic little spicy horseradish sprouts! 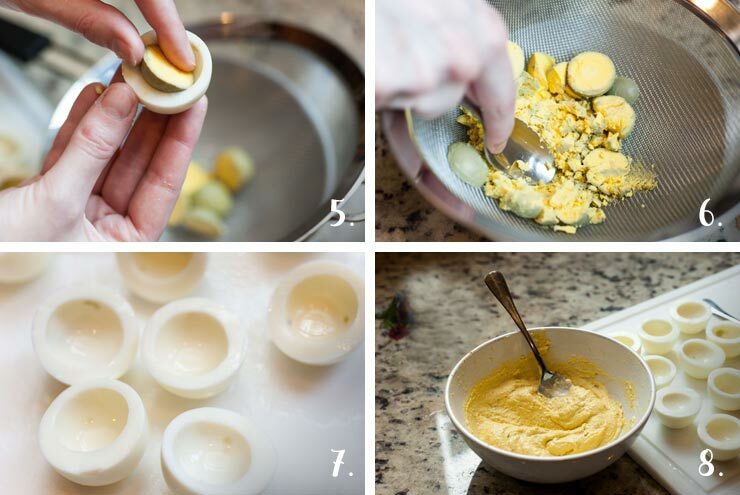 I’ve never used them in deviled eggs before so it’s quite exciting. They give a tiny little horseradish kick to the perfectly flavorful egg. And as always, I love adding flowers to my deviled eggs. I used waxflower for these. 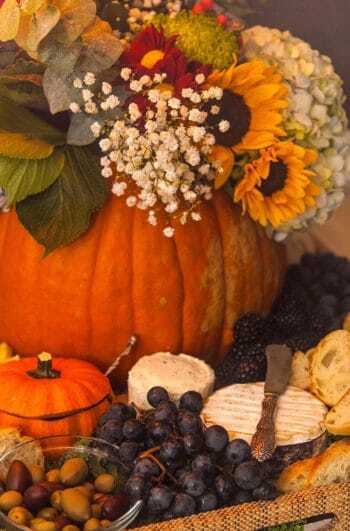 It’s a perfectly edible flower that doesn’t have too much taste, so they don’t compete with any other tasty ingredients or textures. I used poppy seeds for the garnish on top, but if you don’t have any in your spice cabinet, I’d suggest a cayenne pepper or even a celery salt! Just a little sprinkle. To get the beautiful red color, I just added a tiny drop of dye. I know, not so fancy. I just didn’t have a beet lying around. But YOU can use beet juice. You only need a few drops to give your deviled eggs a pretty pink/red/purple color. 1. 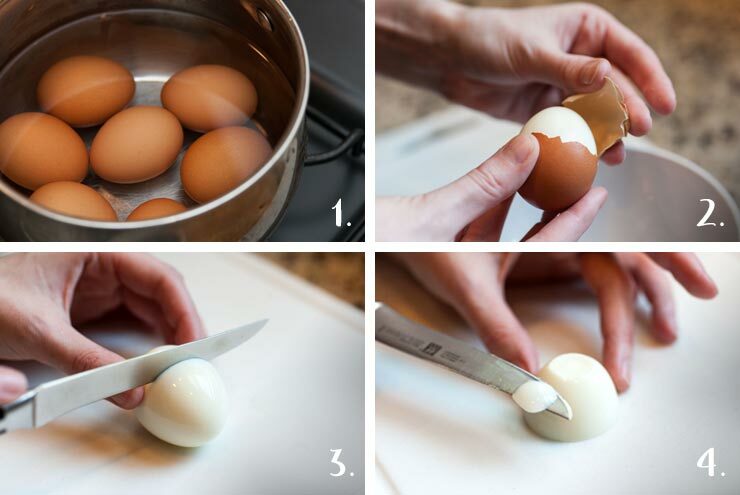 Add six large eggs to a pot of cool water, then place them on the stove and boil them for 25 minutes. Once boiled, place them in a bowl of cold water for 10 minutes. Refrigerate for 1-2 hours. 8. In a small mixing bowl, mix in your mayo, mustard and creamy horseradish with a few shakes of salt and a few shakes of fresh pepper. You want your consistency to be like hummus. Finally, add a drop of red dye or beet juice and mix. 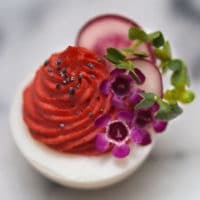 Add the filling to your egg halves, and garnish with sliced radishes, horseradish sprouts, waxflowers and poppy seeds. 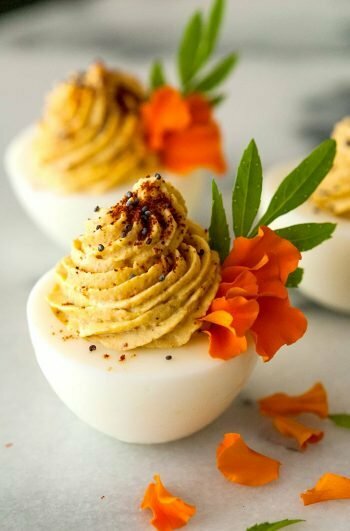 These deviled eggs are so pretty, they’ll make cupid’s wing flutter! Mix in your mayo, mustard and creamy horseradish with a few shakes of salt and a few shakes of fresh pepper. You want your consistency to be like hummus. Add your drop of red dye or beet juice and mix. 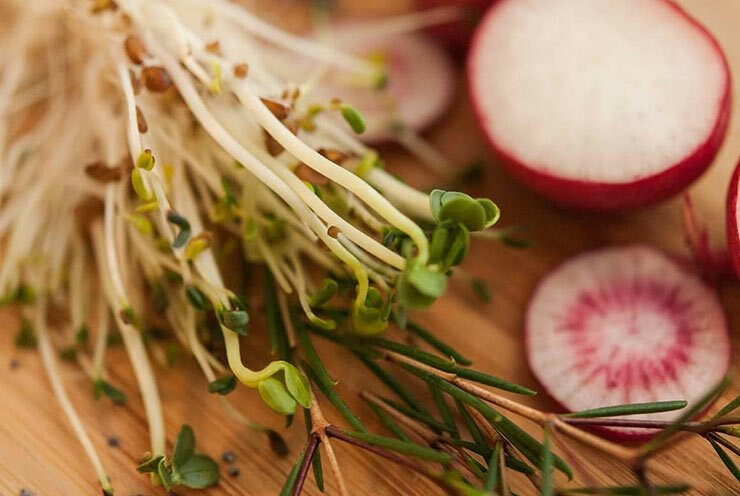 Garnish your lovely little eggs with sprouts, flowers, radishes and poppy seeds!